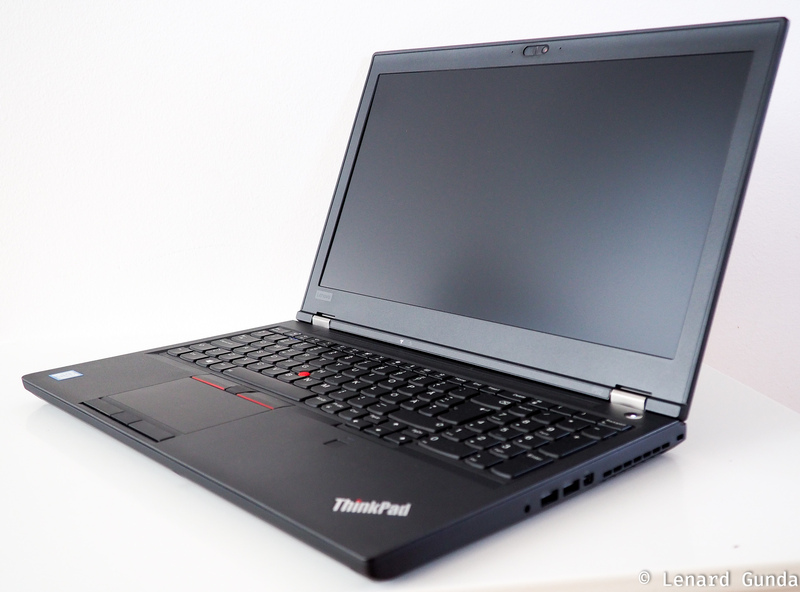 Lenovo announced the ThinkPad P52, its next generation mobile workstation back in June. It packs the latest 6 core processors from Intel and even a VR ready Quadro GPU from NVIDIA: plenty of power for anybody. I have been waiting for it for quite some time: this is my next work computer. The P52 is the third generation model in the P5x series. The P50 was the successor to the W series mobile workstations. Although the P52 might be a minor upgrade when looking at it from the outside, it is actually a big step on the inside. With support for 6 core CPUs and a VR-ready GPU, the ThinkPad P52 is a powerhouse for those that need the performance. The amount of memory and storage that can be packed inside is also huge. I outlined my reasons for upgrading from the ThinkPad X1 Yoga to the ThinkPad P52 in my P52 preview article. If you need all the gory details, I refer you to that article. Here is a short summary. The X1 Yoga could not handle all the development tasks I needed to perform for my work. Maximum memory was at 16GB, and the dual core CPU along with the SSDs could not perform as much I needed to. 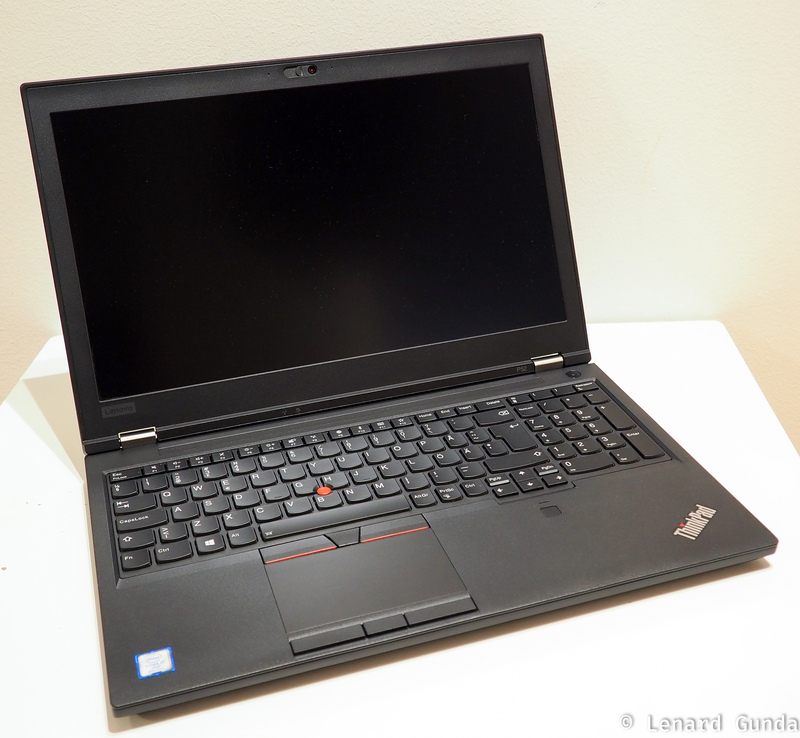 Other machines like the P51 outperformed the X1 Yoga in compilation, and development IDE performance. Some tasks just took too long on the X1 Yoga. Packaging was minimal, a plain cardboard box with Think written on the side. In recent years ThinkPads have been packaged quite minimally. And it uses recycled materials. Inside was the P52 itself, between two plastic holders and a cardboard box, that contains the battery and the power cable. Nothing fancy. Overall build quality seems excellent. The machine felt solid right as I took it out of the packaging. I expected nothing less from a ThinkPad. 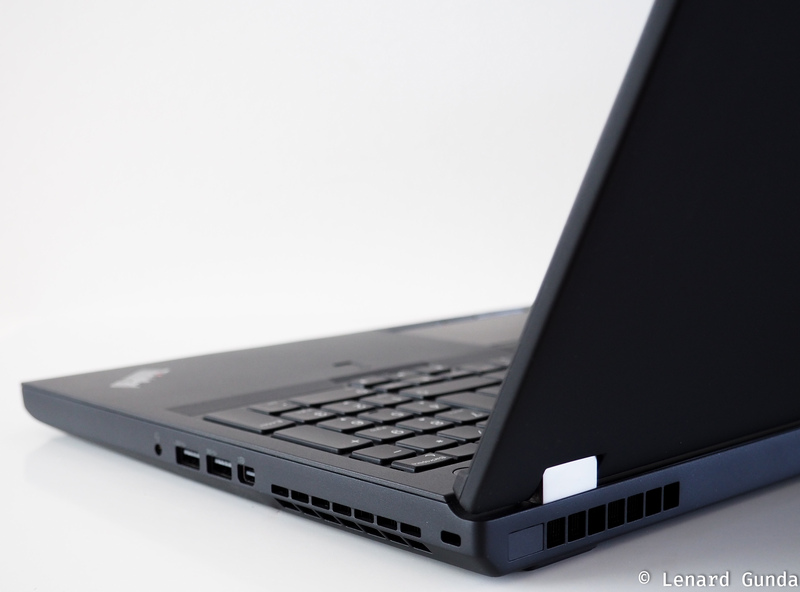 The lid on the outside has the familiar ThinkPad soft touch finish. The ThinkPad logo has the dot on the i glowing in red, which is a design aesthetic I like very much. The etched Lenovo logo from the outside of the lid is gone. Opening up the lid reveals the keyboard and touchpad. It also reveals two indicator lights: one for Wifi and one for storage activity. These are on the bottom side of the display, just like on older ThinkPads, although the color is now white instead of the usual green leds. 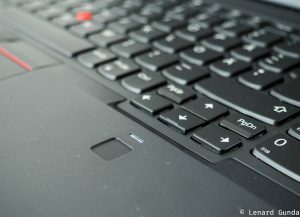 I love the keyboard in the ThinkPad P52! I received a Chicony unit. It feels very sturdy, the keys have a nice resistance to them, and good travel too. The key travel was reduced from the P50/P51. I never typed too much on these units (just tried briefly), so I cannot comment how different the P52 is. But the typing experience is certainly on the better side of all the ThinkPad keyboards I have tried. Also changed from the previous generation keyboard is that some keys – namely the 4 keys to the left of the ENTER key – are a little bit narrower than the rest of the keys. The keyboard has backlight – in fact you cannot order a non-backlit keyboard any longer. The backlight is bright and uniform. The palm rest has not changed much from the P51, it still has a rough plastic feel to it. While it certainly feels durable, I might have preferred the soft touch feel that you can find on the X1 series or the Legion notebooks. My unit came with a i7-8850H 6 core CPU from Intel. It has 6 cores, each running at the base frequency of 2.6Ghz. In Turbo mode a single core can reach 4.3 Ghz. The CPU supports hyper threading, meaning there are 12 execution threads available. The CPU has a TDP of 45W, meaning it will draw – on average – 45W of power. In peak mode, momentarily, the CPU is able to take on even 78W. If it is not too hot it can also take on 55W for a longer period of time, although this usually heats the CPU up and it will go back to 45W. The CPU is very fast in all operations I have tried. Multitasking works seamlessly, even when running virtual machines. I choose the i7 version to be able to choose the P3200 GPU. This GPU is not available with the Xeon processor option. I opted for the NVIDIA Quadro P3200. The actual GPU is of the Max-Q variant. Based on the performance figures, it is close to the GTX 1060 desktop card in performance. The GPU is VR capable. If you have read any of my reviews previously, you will know that I usually do not run benchmarks in my reviews. This time there has been some arguments about how good the 6 core CPUs work in mobile computers and what kind of throttling to expect. Because I gt the notebook relatively early in the product life cycle, I decided to run some tests to see for myself how my unit behaved. I started investigating the throttling and temperature issues by running 5 minutes of the Intel Extreme Tuning Utility Stress test. What I found was that even when stressed, there is no thermal throttling happening. Only power limit throttling. As the CPU is stressed, initially it tries to turbo boost as much as possible. 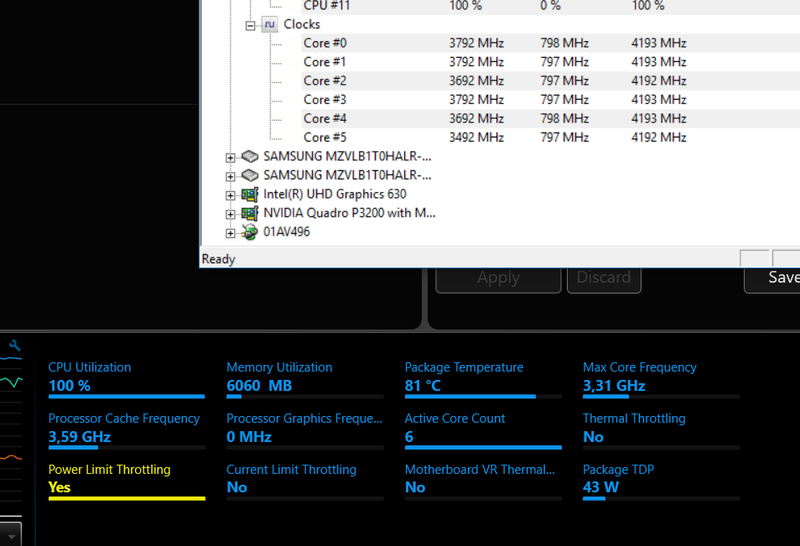 The power limit at this point is 78W, and the CPU can sustain this for a short period of time, before getting too hot. At this point the power limit is decreased to 55W, which reduces the CPU performance and allows it to run more cooler. Finally after a period of time with the power limit at 55W, it is decreased to 45W (the “published” TDP limit for these CPUs). While running the stress test the CPU was clocked at around 3.4-3.7Ghz for all cores. This is less than what the specification say for 6 core turbo boost, which would be 4.0Ghz. But as there is no more power available to the CPU it cannot sustain that speed. Note that this is not a problem, neither is this thermal throttling (which would mean the CPU getting too hot). The cooling system and CPU and TDP limits working together to maintain a working temperature. I monitored the temperatures and core frequencies and found about the same results as with the stress tests before. The CPU does not thermal throttle, and tries to keep a 80-85C temperature. It managed quite well. The TDP allowed about 78W for a few seconds, but at this power level, the CPU package gets very hot very fast. So after the initial surge it drops back to 55W, where it stays until the CPU gets hot again, at which point the TDP limit is dropped to 45W. This is called power limit throttling. Running a single core 100% will produce a TDP of 20W. This calculation would suggest that in order to run all cores at full speed, the P52 would need 120W (give or take). So putting all these cores into a 45W CPU seems like a bit of an overkill on Intel’s part. I also ran PassMark and UserBenchmark. PassMark results are included in the table below. UserBenchmark results are hard to reproduce in this blog, so I will include the links to those. The i7 and the Xeon version seem to be pretty close together. The 3DMarks are won by the i7 but I suspect the stronger NVidia Quadro P3200 has a major part to play in this. The non-graphical Passmark results seem to indicate the Xeon’s power. Overall I am very satisfied with everything. Some people reported overheating, and the CPU going all the way up to 97-99C, this is not something I have seen. I was able to get thermal throttling but only for a second and not constantly. Sometimes if the CPU started working on something, the fans did not have time to kick in fast enough – this is when there was a short period of thermal throttling (less than 1 second). With the cooling kicked in, the CPU maintains a steady 80-85C. The limiting factor for the CPU is the TDP. Meaning the CPU is prevented from taking on as much power as it would need, being capped at 45W – and sometimes at 55W or 78W momentarily. This clearly indicates that stuffing in 6 cores into the CPU and using the same 14nm architecture as before, Intel is essentially capping these CPUs, they are never able to run at full speed. Is this a problem for Intel? Probably so. With their 10nm production technology delayed, they were forced to put in more cores, but without rising the limit or improving the CPU, the entire package is limited. I opted for the Full HD screen. 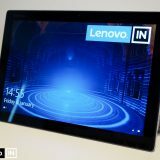 The screen is bright (Lenovo says it can do 300 nits) and looks sharp. Colors are not that saturated, but I would say they are pretty natural, which is actually a good thing. Compared to other FHD screens I have at my disposal the P52 screen seems sharper and more color true. I would say it is a better than average quality screen. I was a little bit worried about downgrading from a WQHD screen in the X1 Yoga I have been using, but I think I will be ok. As I have observed when reviewing the X1 Yoga (2nd generation), the difference between the resolutions in evident if you put them side by side, but during normal usage, it is not that evident. Because I use my notebook mostly docked during the workdays, the screen on the notebook does not matter that much. If I am on the move, then I value the lightness and the longer battery life the FHD screen gives me. I do miss touch a little bit, but the pros outweigh the cons in this case. I choose to forego the IR camera and get the regular web cam. 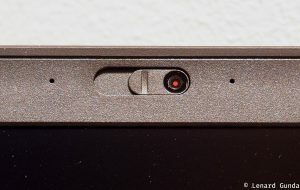 This also means that my P52 includes the ThinkShutter, which physically shuts the webcam lense. Because I use the notebooks mostly docked, I did not want the IR camera (which can do face recognition and Windows Hello). I opted for 64GB of memory. This allows me to comfortably run a VM or two, mobile emulators and development tools all at the same time. My unit came with Micron memory, 2666Mhz DDR4. I was reading when people received their new Lenovo ThinkPads only to see that some people reported getting not so stellar SSDs. Both my SSDs are made by Samsung and they offer excellent performance. 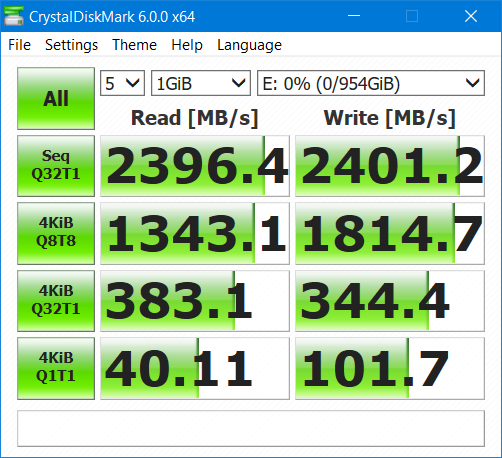 The SSDs are based on the PM981 controller, and seem to be pretty fast. I opted to skip the HDD (2.5″) drive, the two M.2 SSDs should be plenty enough. 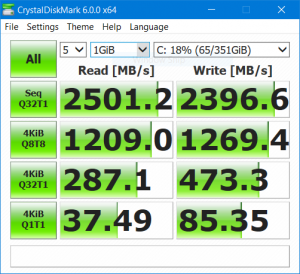 I did some SSD benchmarking myself (see below). If you want a more thorough analysis, read more about this particular model at Anandtech. 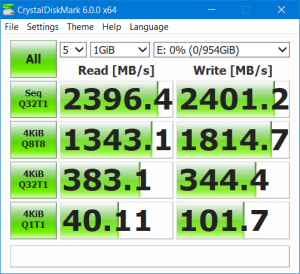 I benchmarked my SSDs both before and after applying BitLocker encryption to the drives. First the results witout BitLocker. So I am not too concerned about the effect BitLocker has on the drives. I need all my drives encrypted because of work reasons, but I would probably encrypt them myself anyway. 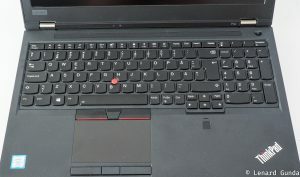 The keyboard is a pretty standard ThinkPad keyboard. For newcomers it might be strange that the Fn key is first, and then the Ctrl key. If you are bothered by this, you either apply a software fix inside Lenovo Vantage, or go into the BIOS and have the two keys switched. By default the Fx keys perform the extra function built into them. To access the Fx function keys, you need to press them together with the Fn key. Or you can activate FnLock, in which case a small led lits up and you can use the Fx function keys directly. 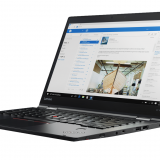 If you rather had this the other way around – Fx by default and multimediafunction with Fn/FnLock – again, you can either apply a software fix in Lenovo Vantage. Or go into the BIOS and change the behavior there. Which is what I did. 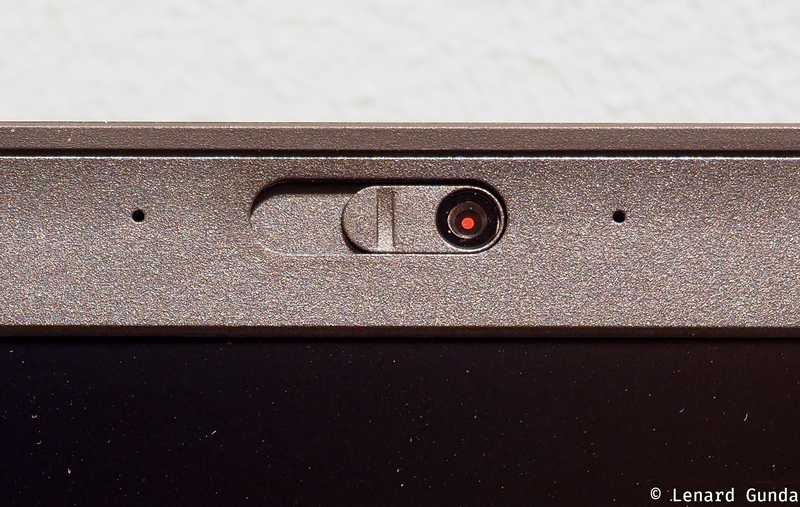 The fingerprint sensor is a little bit smaller than what previous models had. I sometimes find it has difficulties with recognizing my fingerprint, but the failure rate is not alarmingly high. 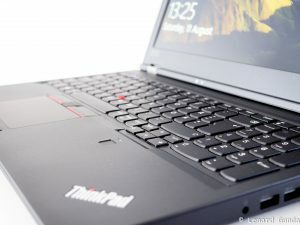 The fingerprint reader is a Synaptics model – so basically the same thing I have used in other ThinkPads. I have no idea why the size was reduced. The touchpad was a bit of a disappointment at first. I have used Synaptics touchpads for many years, and this one came with an Elan touchpad. In fact, looking at the drivers, there is not even an option for Synaptics touchpads. I also dislike the surface. It is ok, but not as good as glass would have been. After some usage, it does feel that the touchpad works as really well, recognizes multi touch gestures, and has a good reaction time. It has Windows precision drivers, meaning it should work very well. The buttons are a little bit too soft, and not clicky, which I dislike. So in the end, the Elan touchpad does not seem to be a problem at all. But I find it lacks the multitude of configuration options that were available with Synaptics touchpads. I could not find a way to configure the multi touch gestures for example, which one to use, and how they should behave. 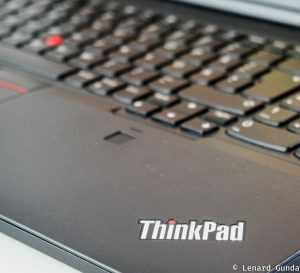 The trackpoint works the same way as on other ThinkPads. The trackpoint buttons I find a little bit too soft for my liking, but within working range. 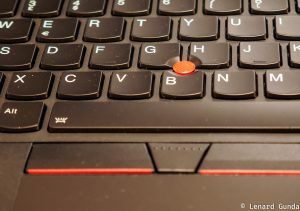 The little bumps on the middle trackpoint button are somehow very shallow and in the wrong place, I cannot really feel them. Compared to the X1 Yoga (1st generation) they are much less pronounced, which is a bad thing in my opinion. It would be good to properly feel this middle button. 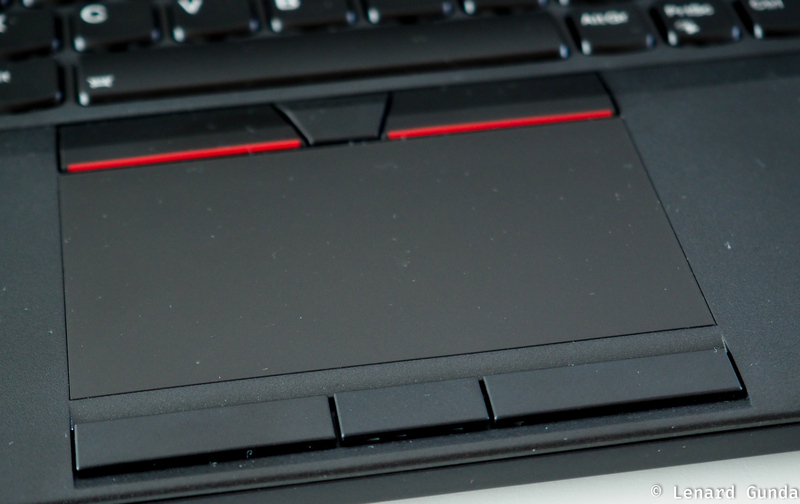 The thinkPad P52 has a wide variety of ports on all sides. Audio is loud and clear, and speech sounds very good on the P52. The same cannot be said of the bass, which the speaker completely lacks. This works very well for conference calls. If you want to watch movies, then based on the movie this may or may not work out for you. Don’t expect to enjoy the latest action movies with explosions and effects on these speakers. To enjoy Dolby Atmos, you need to plug in headphones into the audio jack. Dolby Atmos will improve the listening quality by trying to detect the type of sound source (music, game, etc) you are listening to, and adjusting what you hear. I am no audiophile, so take this with a grain of salt. I did enjoy the enhancements that the Dolby Atmos software did with the sound. Music sounded slightly better than without it. If you are using USB headphones – like headsets – these will not be affected by Dolby Atmos. Only headphones plugged into the headphone jack will be affected. I have not yet had time for extensive battery testing. I will add to this section as I complete more tests and have real world usage. Light usage I have tested. With web browsing, writing notes or documents in Office, replying to emails the notebook can easily do 8-9 hours on a battery, maybe even 10 is possible. This is because of the FHD screen. The 4K+touch option would not allow such endurance. Medium and heavy usage times are not yet available. 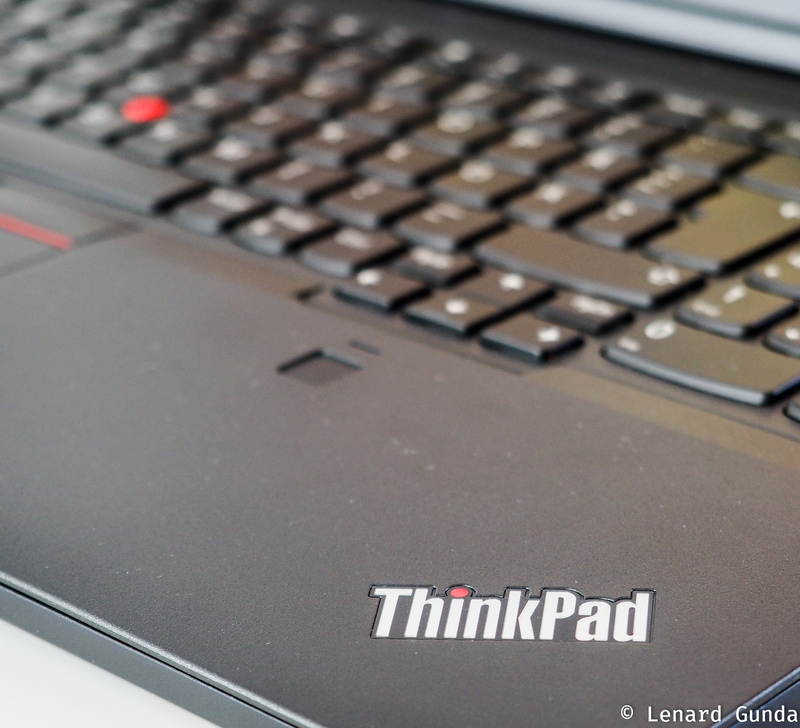 Lenovo has been true to its word, and especially ThinkPads ship without any excessive software installations. This is more true on the ThinkPad P52, which didn’t even get the usual McAfee anti-virus treatment. 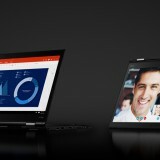 Beyond the Lenovo drivers and the Lenovo Vantage software, there seems to be nothing extra here. This is not to say there is no junk: thanks to Microsoft, all sorts of apps and games are installed by default on Windows. Luckily these being Windows Store apps, they are very easy to uninstall and remove. 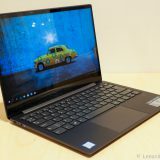 The notebook does include Lenovo Vantage, the place where you can find anything related to your computer. For those who are still unfamiliar with this utility, please give it a try. It can install Lenovo driver and software updates, it can change hardware settings (like battery charging thresholds, power behaviors, etc). It can tell you about your computer, show warranty information etc. Even if you clean install Windows on a P52, you should be able to download Lenovo Vantage from the Windows Store. 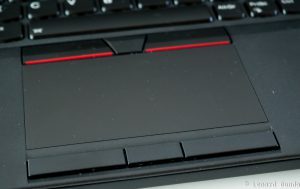 The ThinkPad P52 dropped support for mechanical docks. All ThinkPads are now using Thunderbolt 3 as the docking technology. Before I received the Workstation dock, I also used the ThinkPad Thunderbolt 3 Dock at my workplace. It works ok with the ThinkPad P52, with some minor issues. I also need to connect the 170W power supply to the notebook, because the single USB-C / Thunderbolt 3 cable cannot carry enough juice to power the P52. The minor issue is, that when the display turns off (sleep or just power saving), sometimes when coming back online the external displays start to flash. I need to reconnect the dock to make it stop. Installing the latest dock drivers and dock firmware does not help. The ThinkPad P52 is a powerhouse, full of performance. No wonder UserBenchmark calls it a Nuclear submarine and a UFO. 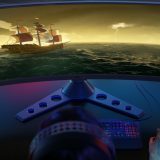 Even the gaming performance is described as a Battleship. I am very satisfied with the performance of this machine. Yes, there is power limit throttling, but that is kind of unavoidable, and in the end, the actual performance is what matters. I like the long battery life as well, for those occasions I am away from my desk. And yes, you can also game on this thing, quite well I might add. I will want to do some VR tests with the Lenovo Explorer, but that I leave to another article. Mobile workstations are not for everyone. They are bulky, heavy and expensive. 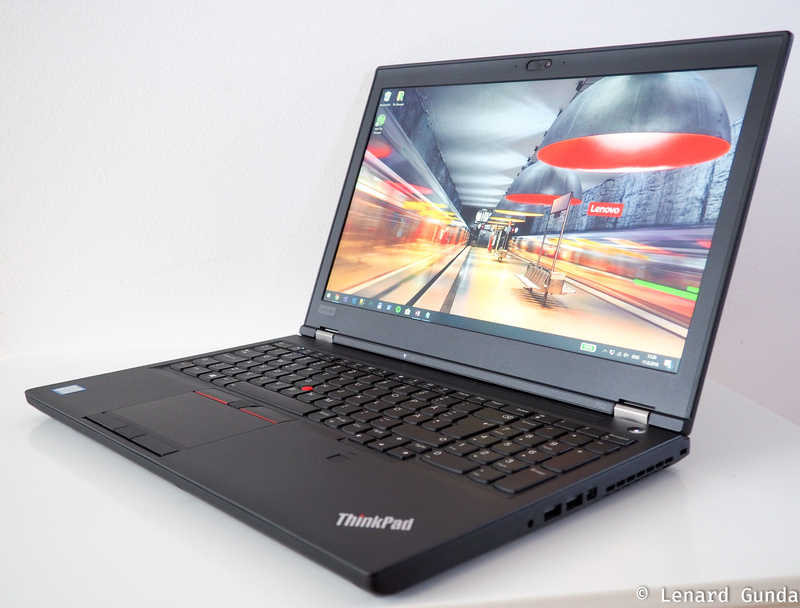 But if you need this kind of performance, then the P52 will serve you well. If you are looking to do Office work, write notes and emails and watch movies, then look elsewhere. Other computers will serve you much better. If you are looking to do CAD, 3D modelling or game development, this is the machine you will want. If you are going to do software development, you need to look at your workload and what you want to do. Web development or simple programs do not require that much performance that you would need a computer like this. For students, the performance might be overkill and the price will probably be too high, unless you have some sort of discount from your university. Let the p72 come out. 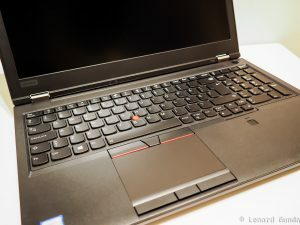 How about the Thinkpad X1 Extreme? If you are asking why I wouldn’t go for the X1X, here are my reasons. First of all, to get it with 64GB of RAM you need 32GB modules, which makes it ultra expensive. Second, being thinner than the P52, it will probably throttle even more to keep a stable temperature. Third, the GTX 1050 Ti is not as performant as the P3200. Thank you for your reply. I was indeed wondering why you didn’t go for the X1X. 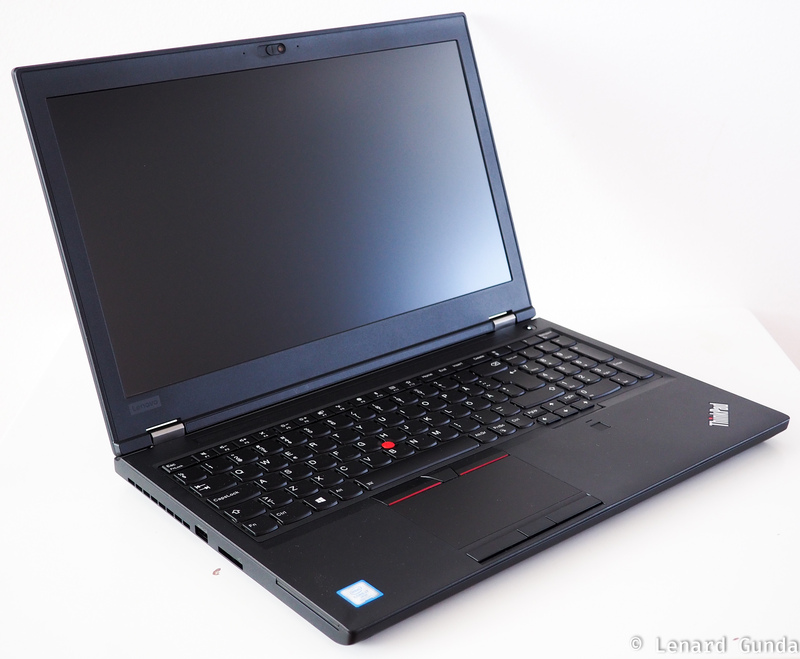 As going from X1 Yoga to P52 is a huge difference. I am owning a P50 and would like to have something smaller. Don’t get me wrong P50 is a great machine. The X1X is the thing I am looking for. 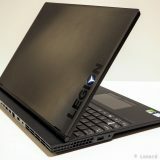 I am waiting for the review and I am wondering if Lenovo did a good job about the cooling as with the P50. As developer too I am less interested in the GPU. Maybe for gaming, but I have a dedicated rig for that with a GTX 1080 Ti. Or an eGPU in the future over Thunderbolt 3. Thank you again for your reply. I am wondering about the difference between an i7 versus Xeon for development. Any idea on that? Do you know if the key travel is smaller on the very thin 1 Extreme or P1, so it will not be as nice to type on? That’s a great question but I unfortunately do not have an answer to that. 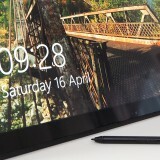 The PSREF specifications for the P1/X1X does not specify the key travel. But as all X1 Yogas so far had a great typing experience despite having lesser key travel to T/P series models, I really hope the P1/X1X has also a top of the line typing experience. 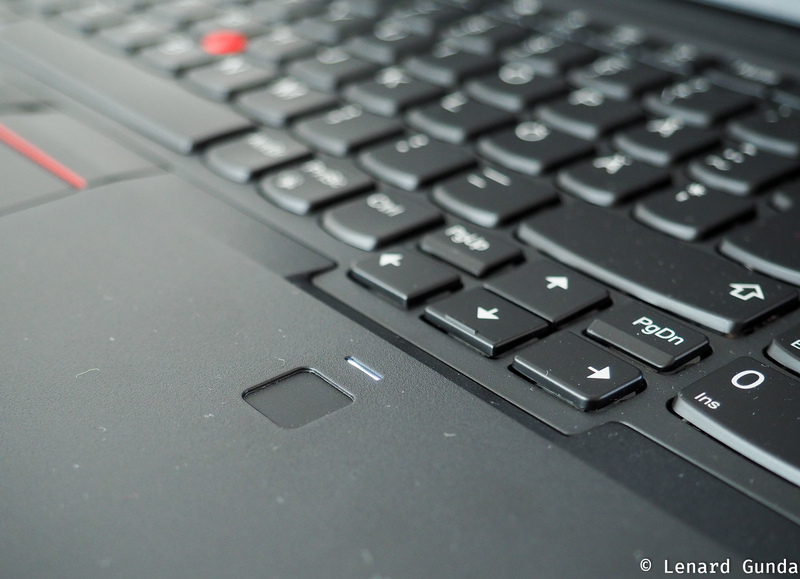 The X1 series is still very important to Lenovo, so I doubt they would compromise on the keyboard. We will have to wait for the first reviews to find out how it really feels. 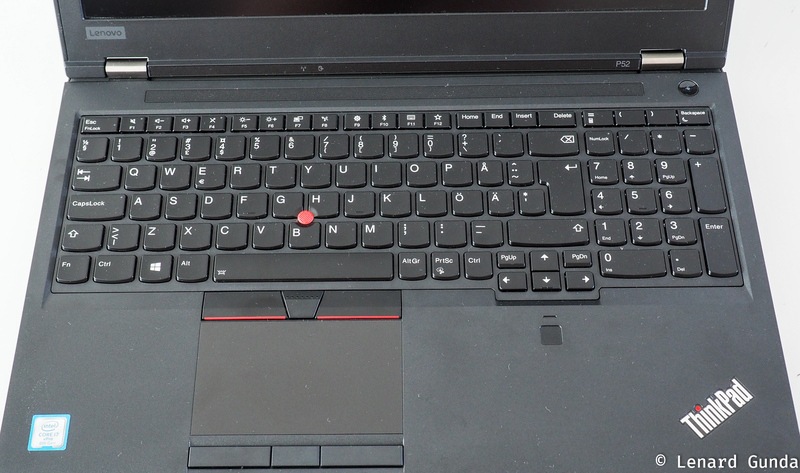 In fact this year Lenovo has placed on P52 the same (smaller) keyboard of T580 and P52s. P51 had a legendary full-size keyboard. Do you type a lot? Is it annoying that some keys are smaller than others? Yes, I do type a lot. I am touch typing, so I do not look at the keyboard at all. The X1E and P1 have a very good keyboard, similar to X1C. Unfortunately if you want to replace these keyboards, you have to disassemble the whole computer. Instead the keyboard of P52 can be easily replaced from the top. It’s a very good review. I’m planning to buy it on this black Friday. Can I have a question? Is 2666MHz of ram available for p52? Because I have read the p52 manual it indicates that speed of ram was limited by cpu at 2400MHz. But if the 2666MHz can run on it. I would be great. If you order from Lenovo, the P52 will get 2666 Mhz memory modules. I received 4 Micron modules inside my P52, each 2666Mhz DDR4 memories. But Intel has a limitation in the chipset to support memory up to 2400 Mhz. So even though the computers are shipped with faster memory, the computer will not take full advantage of that. If you are doing an update yourself (adding more memory), you could possibly use slower memory (2400 Mhz). I do not know why Lenovo decided to supply faster modules even though they are not supported at the moment. A great review for a great notebook! Moreover I have to say that your pictures are really beautiful. Just a curiosity: on the left side I’ve noticed a plastic dummy where the smart card reader should be. 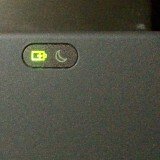 Isn’t the smart card reader always present in ThinkPad notebooks? I opted not to get one. When configuring you can either have it or not. So it is optional. I thought about it, but never needed one and there is nothing to indicate this will change 🙂 So that is why I configured my P52 not to have it. It was a pleasure to read your review. You obviously address relevant matter and you have a writing style, which is a pleasure to read. *) Could you add a photo of the plug for the mains cable of the power supply, does it have the same 3-pin connector as an adapter for a W540? *) Do you have some performance comparison with a W540 (i7-4900MQ)? 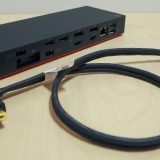 *) Do you know if it works well connecting it to a TV using the HDMI port, because W540 does not after Windows and drivers have been updated. *) Is it Microsoft Visual Studio you use for your software development? *) Are you using Windows 10 Pro for Workstations and MS SQL Server 2016? Do you know, if MS SQL Server can use the specific NVMe drives in persistent memory mode and achive really high read/write performance? I can add a photo of the power adapter a little later, but basically it is the same thin tip power adapter that Lenovo has been using for generations now. As far as I know, it is basically the same that the W540 also uses, a 170W power adapter. Unfortunately I do not have a performance comparison with the i7-4900MQ. Not even notebookcheck seems to have performance metrics for that particular CPU. If you currently have this one, why not run Cinebench R15, then you can directly compare your own results to others? I haven’t actually tried connecting to the TV yet, only monitors. But I did try several monitors and different cables, I tried directly the HDMI port and I also tried a TB3 port with an HDMI adapter (so the monitor used an HDMI cable), and everything has been working. But I will try hooking it up to our TV, and will reply back here. Yes, I use Microsoft Visual Studio for development. I usually use the latest released version, which would be 15.8.4 currently. I think I installed 15.7.6 first on the P52. I have Windows 10 Pro installed, not the Workstation version. I have SQL Server 2017 developer installed, but I rarely really use it. When I do, it is just simple and small databases, nothing big, and I have not tried persistent memory mode yet. We use remote databases most of the time during development, usually from Azure or through a VPN connection. The reason I ask for the connector for the mains cable at the adapter, not the notebook end, is, that I have a cable with an EU plug, which is different than a Danish plug and the EU plug I can use basically everywhere I need, but the Danish one I can only use in Denmark. When ordering a ThinkPad in Denmark, it is being supplied with a wire having a Danish plug. I know from experience, that it can be a bit difficult to get the right kind of cable so it could be easy to use the old one, if I order a P52. Do you get Cinebench R15 from https://www.maxon.net/en/products/cinebench/? When connecting to a TV, can you check if you also get correctly synchronized sound and a sound refresh rate of the display, please? Are you aware if the “for Workstation” variant of WIndows 10 actually brings some benefits with this machine? Thank you so much for this great review Lenard! If someone is looking for a non-gaming high quality 15.6″ FHD laptop, based on one of the more recent CPU’s and GPU’s, i.e not starting with a kind of ‘backlog’ whilst using an older CPU, plus 16GB RAM 512GB SSD (probably becoming more or less the defaults in the coming years anyhow), then, yes, I am sure Lenovo offers other products as well. Some of them may be 10-20% cheaper. Then again, when considering the better performing GPU in the P52, the others may come close to the price of the P52 (e.g. 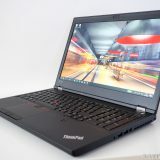 T580) . 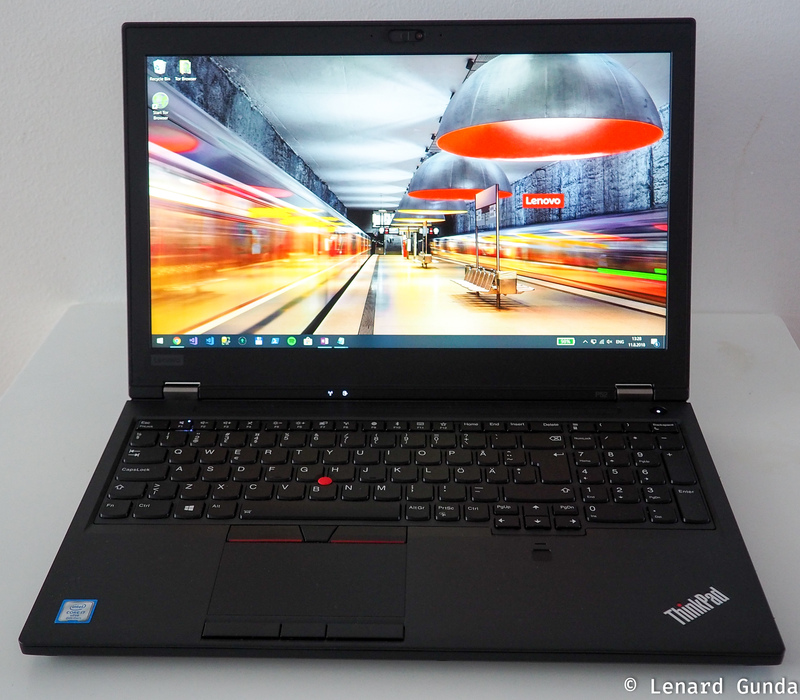 The X1 Extreme, based oni7-8850H, has even a slightly higher price tag. With this I want to say that, considering the specs and quality, I believe the P52 doesn’t have so much ‘competition’, within Lenovo I mean. But that aside, again, great review! Very interested in the Intel Tuning Utility, would be interested in how much you can tune. Before any tuning, it actually gets much better results on battery, much less throttling then. Is it possible you can test the thermal and clock behaviours of the cpu and gpu with FurMark and Prime95 running at the same time, for 10 minutes at least? 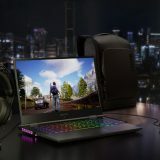 I ordered a similar P52 (only difference is 4k touchscreen) but i won’t get it for a few weeks, and im worried that combined cpu and gpu loading will tax the cooling system too much. I had such issues with the XPS 15 9570 leading to inconsistent performance, especially the occasional stutter in games. I know FurMark and Prime95 at the same time is an extreme and unrealistic case, but i would like to have some confidence in the cooling ability of the lenovo p52. 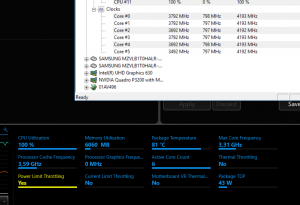 and before anyone gets doubts that it is possible to cool such hardware without throttling, i had a Gigabyte Aero 15x v8 with 1070 maxQ and 8750h. Its very thin, but with a -0.135V undervolt, and boosting the PL1 limit to 57W that machine was able to run both furmark and prime95 for an hour, and held its clocks stable at 3.9GHz for all cores for the cpu and nearly 1.5GHz for the gpu, for an hour. So it is definitely possible to pack such powerful hardware in a thin device and have unthrottled performance. Thanks for the review! Very comprehensive! Clinched it for me. ordered the same machine as you except with 4K screen and less ssd space (Most of my projects will be dumped into external storage after completing anyway) I’ll be using this for 4K video editing, photo editing and layout design so your review gave me the confidence that this machine can handle all those adobe programs running at once. Hello, thanks for the great review. 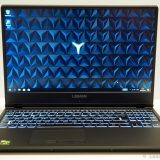 Would you recommend this laptop for someone, using programs like, office, photoshop, lightroom, premiere pro at the same time? Basically for web&photo&video development. Also as it takes a lot of “juice” to run, would it be possible to get a display with usb-c thunderbolt to run the power on this beast. Fx the soon to come LG 34WK95U-W or other similar thunderbolt screens. I have a W540 (maxed out at the time, 3K display, Intel Xtreme, 32GB, 512 RAID 0) Do you think I should go for P52 or P72 (maxed out). I’m more interested in heat management for a maxed out machine. That’s why P72 might be better, but I’m just guessing here. Did you weigh your unit or are you going by the spec sheet? Because I have an almost identically specced unit which tips the scales at just under 2.7kg, despite being advertised as 2.5kg. Out of curiosity: did you partition (one of) the drives? If not, forget the rest, but if so, how does it look in Windows diskmgmt ? Specifically with regards to the so-called “unallocated space”. SSD’s have the usual unallocated space. With your 1TB SSD it’ll probably be around 100GB+(??) being just a wild guess from me. Will the unallocated space then be split ‘pro rata’ over the 2 partitions, e.g. 25GB and 75GB (which I assume), or is each partition holding 100GB? I did partition the first 1G drive. The second one is one big partition which shows up as a 953GB drive. It is actually Disk 0 in partition management. Disk 1 which is the system drive, is now in several parts. Does the P52 with the Nvidia Quadro support Optimus to switch between the dedicated GPU and the Intel-GPU? Yes, it does the switching automatically. One of the most comprehensive and useful review out there. Thank you for taking the time to test both configurations. I currently own a p50 and I am looking to upgrade since I do a lot of CAD, sketchup, photoshop, AE, etc. Since you tested both the Xeon with the p2000 and the I-7 with the P3200… what would you recommend? The numbers seems to give a slight advantage to the i7 with p3200, but is it worth the price difference? Also considering getting an external GPU through USB-C. Thank you!!!!! My personal feeling is that unless you know you need the Xeon, you should not put money into that “just in case”. The only reason I see is the support for ECC memory, but I am not convinced that I would need ECC memory. If none of the software you run explicitly requires it, I would recommend gettin the i7 version. Also, as even the i7 version is limited by the thermals of the CPU, there will not be any major performance differences going upward. So I do recommend the i7 version. As for graphics, if you require color accuracy, I would recommend you go 4K. If you use external dispalys anyway, save money on the 4K+touch combo. For the use case you describe the P2000 seems to be enough. Especially if you are looking at an external GPU. Thank you for the feedback. I am still torn o the 4k since adding eight and less battery life is an issue. The P50 was about the max on weight for carrying around. I will take your advice on the i7, but will go for the p3200 to better support aftereffects and VectorWorks. I also looked at the P1. Almost ordered it just for the form factor, but I worry about 3D performance and throttling. Wish I could rent to buy until I find the right one ha! Great review. I have the P72 and many of the points of your review also apply to it. 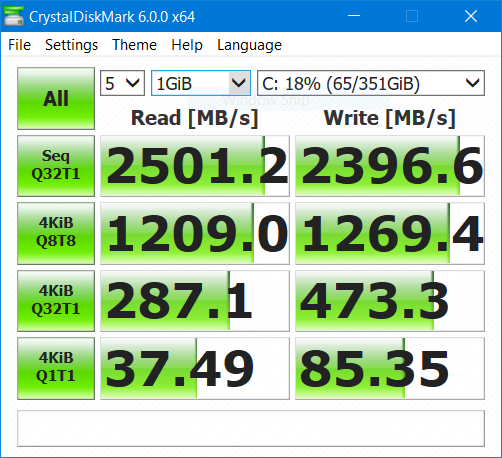 I added a Samsung 1 TB 970 EVO SSD that I bought for cheap and get better benchmark scores in CrystalDiskMark. Multitouch behavior can simply be configured in Touchpad settings (search for touchpad). You can surely apply at least a -125mv undervolt in XTU to get better performance. Hi, nice review and article. I just bought a Dell Precision 5530 with E-2176m & P2000. Was debating between this and the Thinkpad P1 but ended up going to Dell. Did not go with the i9-8950HK version since many reviwer said the i9 in XPS 15 just isn’t sufficient to cool it, and make full used of it. Btw, I would like to ask, for E-2176m, using XTU, what is the best setting for it?